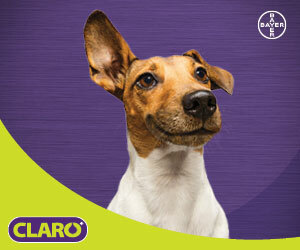 Figure 1: This is Nacho’s appearance on initial presentation at the clinic. Note the tear-soaked fur around the eyes and visual swelling of the lateral face/neck. Last month, I discussed surgical approaches to sialoceles. In this month’s column, I’ll tackle rare salivary gland conditions that are treated medically rather than surgically. Let’s start with some definitions. Sialadenosis refers to noninflammatory, nonneoplastic enlargement of the salivary glands, which tends to not be painful. Sialadenitis is inflammation of a salivary gland (synonym: sialoadenitis). Necrotizing sialometaplasia is squamous metaplasia of salivary gland lobules and ducts with ischemic necrosis of the salivary gland lobules (a histopathological distinction). Sialadenitis appears to occur more commonly in dogs than in cats, and terriers may be overrepresented. Inflammation or infarction of the salivary gland may be more common than is clinically appreciated. In one study that reviewed results of salivary gland biopsies of dogs, inflammation or infarction was seen in 34 percent of cases.1 The mandibular gland is most commonly affected, but any glands (major or minor) may be affected. 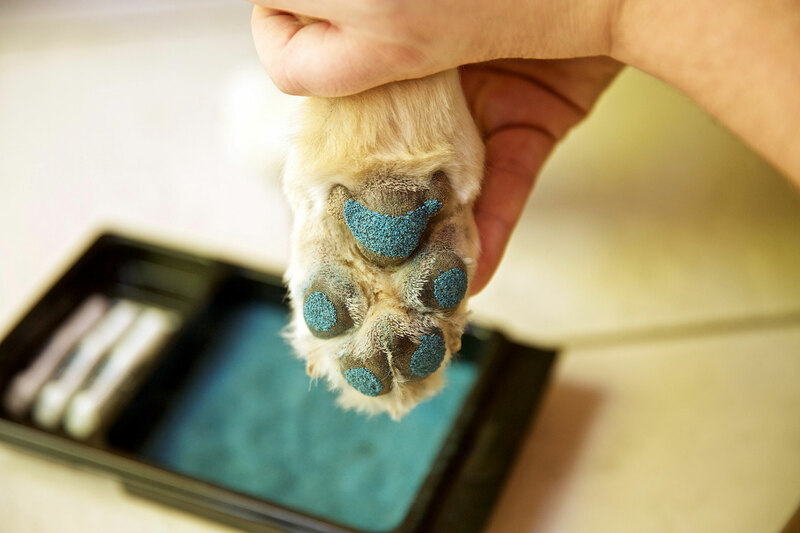 In people, this disease seems to be minor and self-limiting, but in dogs it can be life-threatening. 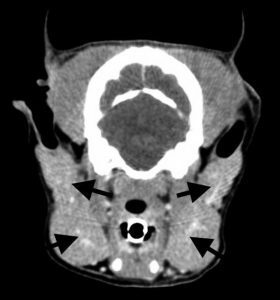 Figure 2: CT scan image showing enlargement of both parotid salivary glands (upper arrows) and mandibular glands (lower arrows). Concurrent esophageal disease is seen in some cases of salivary gland inflammation, and if the esophageal disease can be diagnosed and cured, the salivary gland problem often resolves. 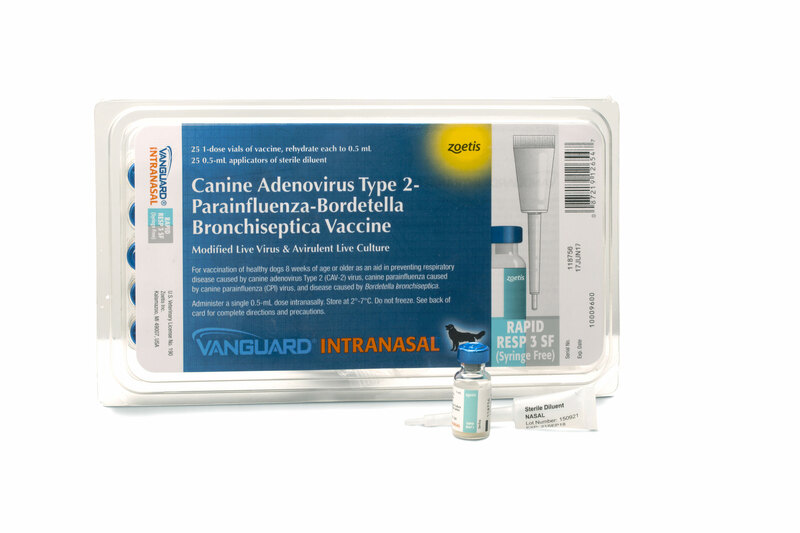 In a study published in the Journal of Small Animal Practice, 19 canine patients with esophageal diseases, such as esophagitis, megaesophagus, and Spirocerca lupi infestation, had concurrent salivary gland necrosis; successful treatment of the esophageal disease resulted in resolution of salivary gland necrosis. It has been hypothesized that an afferent vagal reflex may be involved where the efferent targets are the salivary glands. One study that evaluated outcomes of surgical treatment of necrotizing sialometaplasia surprisingly found no benefit to surgical removal of the affected glands.4 Improvements with phenobarbital administration suggest a neurogenic origin. Besides phenobarbital, other modalities include intravenous fluids, pain medications and anti-inflammatories (NSAIDS or inflammatory doses of steroids), and +/- intravenous antibiotic therapy if infectious etiology/secondary sepsis is suspected. Diagnosis is made via physical examination, imaging (CT, MRI), and cytology or biopsy of the affected gland. Figure 3: Nacho’s appearance after beginning oral phenobarbital therapy (2 mg/kg q12h). I don’t see many patients with sialadenosis (enlarged, nonpainful glands with no cytological changes), so when I do diagnose it, I tend to remember those cases. 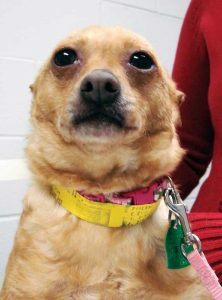 Nacho, a middle-aged Chihuahua, presented with a four-month history of palpable nonpainful swellings in the neck, bulging of the eyes, and mild bilateral ocular discharge (Figure 1). Nacho had an otherwise bland medical history except for a history of seizures occurring less than four times a year; due to infrequency, he was not currently receiving anticonvulsants. On physical examination, the palpable swellings in the neck were determined to be enlarged mandibular salivary glands. Eyes appeared slightly exophthalmic in a bilaterally symmetrical manner, which may have been due to enlargement of the zygomatic salivary glands ventral to the eyes. Palpation of the parotid salivary glands was also suggestive of possible bilaterally symmetrical enlargement. CT scan revealed generalized, bilaterally symmetrical enlargement of the mandibular, parotid, and zygomatic salivary glands (Figure 2). 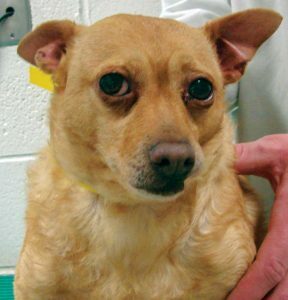 Prior to this case, I had little faith in the use of phenobarbital to treat salivary gland enlargement, but as Nacho was currently receiving no medications and the signs were occurring for four continuous months, I believed this would be a good test to see what phenobarbital could do. I prescribed phenobarbital (2 mg/kg PO BID) and recommended a recheck in two weeks. At Nacho’s re-examination, I was very impressed with palpable reduction of the size of the salivary glands. Nacho’s overall appearance had changed, and the exophthalmos and ocular discharge also subsided (Figure 3). 1 Spangler WL, Culbertson MR. Salivary gland disease in dogs and cats: 245 cases (1985-1988). J Am Vet Med Assoc. 1991;198(3):465-469. 2 Schroeder H, Berry WL. Salivary gland necrosis in dogs: a retrospective study of 19 cases. J Small Anim Pract. 1998;39(3):121-125. 3 Stonehewer J, Mackin AJ, Tasker S, Simpson JW, Mayhew IG. Idiopathic phenobarbital-responsive hypersialosis in the dog: an unusual form of limbic epilepsy? J Small Anim Pract. 2000;41(9):416-21. 4 Brooks DG, Hottinger HA, Dunstan RW. Canine necrotizing sialometaplasia: a case report and review of the literature. J Am Anim Hosp Assoc. 1995;31(1):21-5.